Faulting application wfica32.exe, version 13.1.201.3, faulting module msvcr80.dll, version 8.0.50727.6195, fault address 0x0001574d. After removing the offline printers on both the lab and the tech’s workstation, the issue went away. That being said, it might be more practical to downgrade to an earlier version of the Citrix Receiver. It’s not uncommon for network printers to be taken offline in large enterprises or decommissioned. Worse, imagine mobile users who will show all network printers as unable to connect when outside the network and trying to connect remotely to their virtual desktops. This seems specific to only Windows XP clients. I ran into this again today issue where this was happening on a user workstation even after the disconnected printers were removed. Crash dumps pointed to hpcui6dn.dll. 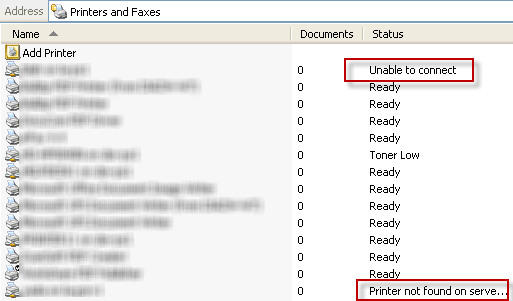 Using the Windows local print server on the workstation, we could see that the print driver belonged to one the disconnected printers. Apparently, an “orphaned” print driver could cause the problem as well. Resolving was a simple matter of stopping and restarting the print spooler and from the local print server properties selecting Remove for the printer driver that was no longer connected. FAULT ->35257cb2 c4b3029b1db1 les esi,[ebx+0xb11d9b02] ds:0023:b130883a=???????????? This entry was posted on August 17, 2012 at 3:57 pm	and is filed under Troubleshooting. Tagged: Crash. You can follow any responses to this entry through the RSS 2.0 feed. You can leave a response, or trackback from your own site. Most helpful, thanks a million!